To increase the production and preservation of the families of Black Bengal goat. Black Bengal goat is a very useful small livestock in Bangladesh. It is also a great source of income for the poor people of this country. Goat farming has a very important role in reducing unemployment and poverty, increasing meat or milk production and earning currency from foreign country. And Black Bengal goat is very perfect for this campaign. There are about 25 million of goats in Bangladesh. Most of those goats are “Black Bengal” goat. This goat breed is very suitable for meat, milk and skin production. The milk and meat of this goat is very tasty and nutritious than any other goat breeds. The female goat became pregnant twice a year and give birth 2-3 baby goats each time. Raising Black Bengal goat can be considered as an additional source of income for the landless or ultra poor farmers. Considering the viability and as excellent source of profitable IGA, Proyas has been encouraging its beneficiaries for rearing Black Bengal goats with the assistance from PKSF. Under the LIFT project, 556 households were benefitted by rearing 6,545 “Black Bengal” goats in 556 farms. These farms are united under 7 clusters according to their geographical locations. Proyas is providing all sorts of technical supports including vaccination, nappier grass cutting to cultivate for fodder, imparting training and micro-credit assistance to these farmers. Proyas has also set up one demonstration farm with 3 acres of land including 1.5 acres for growing grass (from where beneficiaries getting cuttings for their own fodder production) with 136 Black Bengal goats. 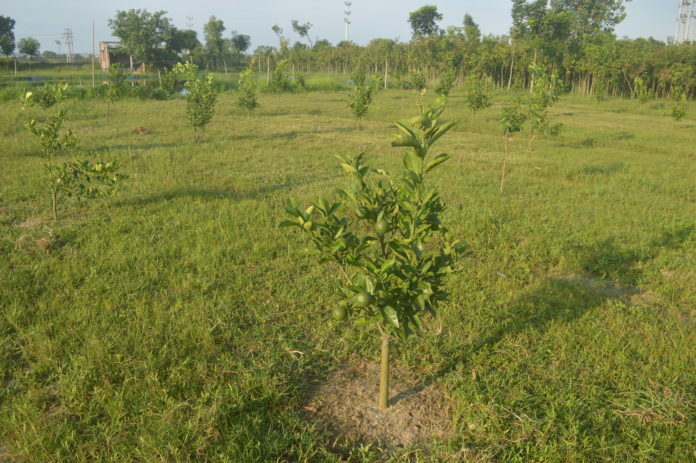 The demonstration also displays how they grow other plants, specially fruits plants like mangos, guava, jackfruits etc.